Hi, I'm interested in moving to 1Password BUT I don't want a huge hassle as I migrate things from Dashlane. I am not a techie and when I look at previous discussion posts here about how to get my info into 1Password, my eyes glaze over and I feel total defeat before I even start. Is there any clear, idiot-proof step by step explanation of how to generate the appropriate data file for 1Password? Thanks. Do you know how to do Step 1? I am switching from Dashlane (Premium) to 1Password 4. I installed the Beta version of 1Password because I am running OS 10.10 (PB2 Yosemite). Now, I am looking for an easy way to import my data. Is a CVS file the way to go? I so, when I export from Dashlane to a CVS file will the values be in the sequence they need to be in? What are the rules for formatting the CVS file? Or if CVS is not my best option, what is? There is quite a long thread here on importing from Dashlane, with a number of suggestions. I am trying to do this too. I did Step 1, but do not know what I have to do in Step 2. Help. It varies the number of columns based on the item type (Login, Note, Credit Card), and this is non-standard. The CSV should have the same number of columns for all the rows. It does not export all data to the CSV - some data is simply missing from the export. It does not allow you to selectively export only certain items (for example, only Login items). This presents problem #1 above. It fails to properly quote certain characters such as double-quote, and this breaks importing programs which expect proper CSV. I just tested this, and find that the bad Dashlane CSV export breaks importing into Numbers 3.2.2. Dashlane's incorrect quoting of double-quotes causes an entry to break into two rows (one Dashlane entry splits into two CSV rows, which would result in two incorrectly sized entries, and 1P4 will not import these since the number of columns varies across the rows). So while you can export to improperly formatted CSV, and open with a spreadsheet program, you are likely going to have to massage the data to (a) re-combine any rows that were split due to (4) and (b) delete any rows that are not Login types. This still might be better than copy/pasting for you. To Import into 1P4 a Dashlane CSV export, you will first have to open the CSV in a spreadsheet program such as Numbers, and remove the non-Login rows (Login items will have 5 columns, which are Title, Website, Username, Password, and Notes), export again as a CSV from Numbers, and then you can import the Numbers saved CSV with 1P4's File > Import selecting the text CSV import format and Login as the Type. Basically, that's what I did. And it worked! Here is a simple solution that worked perfectly for me. Starting in Dashlane, do a File > Export to create an Unsecured archive (readable) in CVS format and SAVE to the Desktop. Use Apple Finder to navigate to the Desktop folder and double click on the file name created in Step1. I have Microsoft Excel installed on my rMBP, so the operating system selected Excel to open the file. On your system it might use Numbers. Delete any columns and rows that contain extraneous data that does not fit the pattern. While still in Excel, do a File > SaveAs in the MS-DOS Comma Separated Value format. Lastly, open 1Password 4 and do a File Input of the CVS file from Step 8. I imported 192 Logins with no errors. Thanks so much for sharing your steps here! I'm so glad to hear that you got everything imported safely into 1Password. If you hit any further snags, we're here to help. I've merged a couple overlapping Dashlane topics together to keep the discussion under one roof. Hi, I would like to do this, but how do I accomplish this if I don't have Excel or Numbers. I occasionally use Google Docs . Is it possible/SAFE to upload the CSV file into a google docs spreadsheet and can I do the same re-structuring there that is necessary for an easy import to 1P? Probably that is a very bad idea. I would instead download and install something like the free LibreOffice, and use its Calc program on your computer instead of over the network. Thanks, is that the same as OpenOffice.org? It is a forked (unencumbered, better!) version. Isn't it generally unsafe to have passwords in plain text on a computer, period? I guess I just need to get it, download it, use it, and delete immediately. While, it has been a while since I did it... I think I just started in Dashlane and did an Export to a CSV file on the Desktop; I edited the CSV file t make sure everything looked good. Then I went to 1Password and did a file Import. Oh, one more thing. I have both password programs installed on my MacBook Pro and also on iPads and iPhones. So, after I made sure all the logins and passwords were clean on the MacBook Pro, I deleted all passwords from the iOS devices. I used DropBox to sync. After my stuff was safely in 1Password, I deleted the insecure CSV file. Indeed, @miccamicca‌. The idea is to perform the migration, move the file to the trash that contains the plain text data, then secure empty trash from the Finder menu. And thanks for letting us know all is well, Mel! Update: DashLane 4.0 is no better. I'm running Dashlane 4.0.0 and 1Password 6.0.1 on a Mac running OS 10.11.3. When I try to import the Excel files into 1Password, they are greyed out in the Finder so they can't be selected. I've saved them into several .csv formats and they still are greyed out and can't be imported. Notice that the third field changed meanings, and the entry has 6 instead of 5 fields. <Cell><Data ss:Type="String"><! [CDATA[Multiline, special chars, ends with a quote "
â ? Æ ? ? double quotes "stuff" and ""
Notice now that the entry has 7 fields instead of 5 fields. It has 7 fields as does an Login entry with both the primary and secondary Login values filled. So, the number of fields cannot be used to determine the category type. And since the data is freeform when entered, it is not possible to reliably determine the "type" of value in each cell - any heuristic would be easily fooled. So, you are going to have to open this data in Excel, and format and separate the data according to 1Password's CSV import guidelines, as mentioned in the support article How to create a 1Password compatible CSV file, and then import the resulting CSV files. I'm sorry to hear that you're having difficulty getting your data imported into 1Password from Dashlane. Please let me know if MrC's post above has helped - he's been a fantastic resource for users looking to import, and we're lucky to have him. I hope that his steps have helped you get all your data safely into 1Password. Have you select the Options button in the lower left of the dialog, and then selected the Comma Delimited Text (.csv) option in the File Format pulldown? I'm having no trouble selecting any CSV files (suffixed, or not). Ignore the blue selection. Had to do that to take a screenshot of the dropdown menu. I've been referring to 1Password's Import dialog settings, not Excel's. 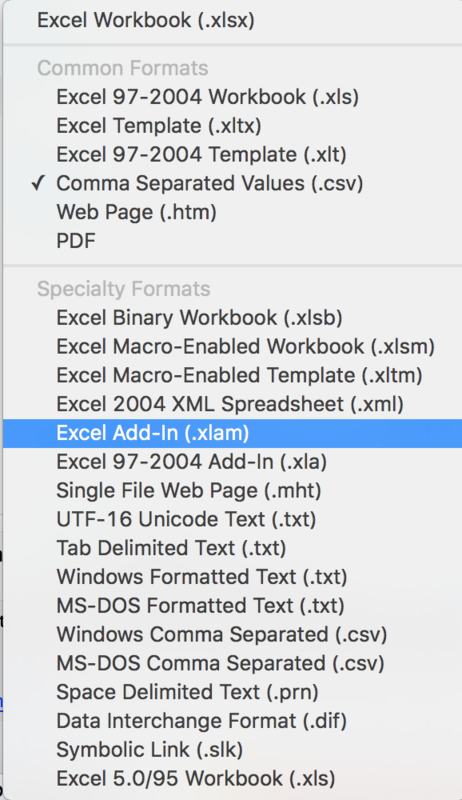 Use the Comma Separated Values (.csv) option in your Excel export dialog. Then, use the settings mentioned above in 1Password's Import dialog. Aha!!! Bingo. That worked. Now to check them. Thank you for your help. The bottom of the CSV had my credit cards, so I deleted those rows. I'll try to import them separately if possible. 5e. Look for rows that have more than these standard columns - usually it is due to a password ending with a comma which the CSV export trips on. Fix these manually or delete them and reset your password for the affected sites. 5f. Delete the email column. As far as I can tell, it cannot be imported using the CSV import tool. 5g. Add periods to all empty notes columns. I did this because my initial import only included 770 passwords, so I assume the CSV was messed up by empty note entries. Note that 1password hangs pretty early on (10 - 50 entries) but after a while completes. A bit painful, but it works. @MrC mentioned some of the same problems with the Dashlane CSV exporter earlier, but I'm glad you got everything sorted out. Thanks for reporting your experience (and those steps)! 3. When there is a password, but no username, Dashlane will put the password in the username column. This script will move the password to the password column. This script won't remove address/identity lines from CSV as there's no reliable way to do it programmatically. You will need to remove those lines manually in Excel or similar software. They are easy to spot, as they should be grouped together near the beginning of the file. There may be other edge-cases that this script does not (yet) handle, but it's hopefully helpful as a start. If you stumble upon another case that this script could potentially fix, then feel free to contribute on Github. That's awesome @ragulka! Thanks so much.